We welcome your help to provide the care that the Lakeshore Nature Preserve needs to flourish. We will likely never have all the funds we need to accomplish the continuous work of stewardship for this very special and much-loved place. We are dependent on the generosity of those who give their time to care for it. 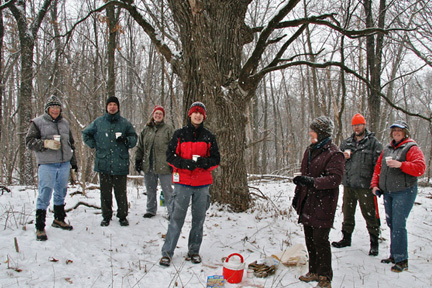 Volunteers enjoy a hot chocolate break. Photo by John Magnuson. Volunteers contribute to the Preserve as individuals, as members of community groups, as students in classes, as groups of friends or family members, as academic units, and so on. If you’re part of a group that would like to get involved with the Preserve please see Group Service Projects below. Attending work parties is a great way to enjoy the Lakeshore Nature Preserve while working with other volunteers to care for it. Work parties are held on one or more Saturdays or Sundays each month (with the exception of January). These are drop-in activities; no pre-registration or prior experience is necessary. Training, tools, and gloves are provided. Long pants and closed-toe shoes are required. Work occurs off-trail on uneven terrain and often requires bending or work on hands and knees. Visit the Preserve Events Calendar to see upcoming scheduled work parties. Please review our guide on How to Dress for Volunteering. Please arrive on-time as we will be walking from the meeting place to the work site. Use the toilet before arriving. Toilet facilities are limited. Groups require advance notice. Please contact the Volunteer Coordinator. Youth (younger than 18) are welcome to volunteer alongside a parent or legal guardian. Work parties are cancelled in case of steady precipitation or severe weather–high winds, thunder/lightning, temperatures below 0 degrees F with the wind chill, or temperatures above 100 degrees F with the heat index. We welcome groups to help us care for the Preserve. The Preserve has benefited from the time and efforts of student organizations, church groups, youth groups, and UW classes. Past group service projects include Fall seed collecting, mulching trails, planting, and pulling invasive garlic mustard plants. Are youth (younger than 18) involved? Youth are permitted to volunteer in groups with at least 1 adult chaperone per 5 youth. Chaperones must participate alongside youth and assist them as necessary. All participating youth must present a Youth Release of Liability form signed by a parent or legal guardian in order to participate. Please contact the Volunteer Coordinator at least 2 weeks in advance of your preferred dates. Unfortunately, due to limited resources we cannot accommodate all requests. Training, tools, and gloves are provided. Long pants and closed-toe shoes are required. Please share How to Dress for Volunteering with your group members. Service Projects are cancelled in case of steady precipitation or severe weather–high winds, thunder/lightning, temperatures below 0 degrees F with the wind chill, or temperatures above 100 degrees F with the heat index. We are happy to try to reschedule group projects. For more information or to request an application please contact the Volunteer Coordinator. Volunteers help keep the Preserve clean and safe, improve biological diversity, prevent erosion, and increase our knowledge to help improve land stewardship. Volunteer activities vary with the seasons and with our current land stewardship priorities. We work hard to make sure that volunteers are engaged in caring for the Preserve in ways that are meaningful to them while accomplishing needed work. One benefit to volunteering for the Lakeshore Nature Preserve (especially for members of the campus community) is that we are on campus! Volunteer activities are performed throughout the 300-acre Lakeshore Nature Preserve, usually in easy biking or walking distance from the heart of campus or along the free 80 bus route. Get a map and directions to meeting places.